All drawings by Renn Tolman. Courtesy of Betsy Street. It took Renn Tolman nearly two decades of experimenting with several regional dory types and different building methods before he settled on the lines seen here for his signature version of an Alaskan skiff. He ultimately produced this boat for recreational and commercial use in three sizes and numerous configurations, specifically for stitch-and-glue construction. The consumer marine press is overstocked with cruising and fishing yarns. I’ve never been a fan of such articles. But a story by Mary Griswold, published in the October/November 1989 issue of Small Boat Journal, caught my attention. Griswold described and photographed a 700-mile boat trip she and designer/builder Renn Tolman had taken two years earlier from Homer, Alaska, across Cook Inlet and down the Alaskan Peninsula and back. If you’re unfamiliar with the geography, this is remote and mostly uninhabited country west of the Kodiak archipelago, featuring spectacular mountain scenery, extreme tidal ranges, strong currents, great salmon fishing, the two largest freshwater lakes in the U.S.’s largest state, along with Alaska’s biggest brown bears. The trip itself, involving lengthy uncharted legs plus a portage (via ¾-ton pickup towing a flatbed trailer, hailed at a commercial dock), was completed in an open 18′ (5.5m) outboard skiff that Tolman designed and Griswold helped build. Griswold’s article was my first exposure to what eventually made Tolman famous far beyond Alaska and even the Lower 48: lightweight, low-cost, “high endurance” semi-custom skiffs. 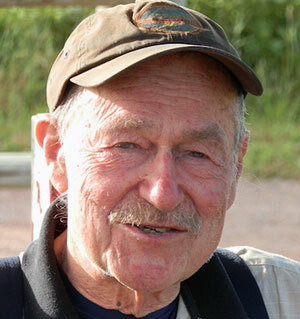 When he died at age 80 of colon cancer in July 2014, Tolman had by then been so successful marketing three signature models he’d developed over a period of decades, that the name “Tolman” became, arguably, the only brand associated with an otherwise amorphous type referred to as Alaskan skiffs. Upon arriving in coastal Alaska, in 1971, Tolman began test-driving a series of outboard-powered classic small craft, most of which he built. The starter boat was a double-ended St. Pierre dory, fitted with a motor well. He found it eminently safe in a seaway, but embarrassingly slow. Tolman then tried on, as it were, other dory types and/or design elements thereof: Carolina Dory Skiff, Cook Inlet Dory, Oregon Dory, in that order. He hadn’t intended to become a boat designer/builder, but his quest for a skiff suitable to what drew him to Alaska—abundant fish and game in still-wild places—set him on a new career path. 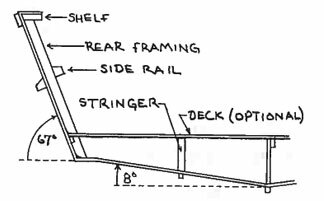 Cross-section drawing for a middle-size 20-footer (6.1m) that Tolman named the Widebody. 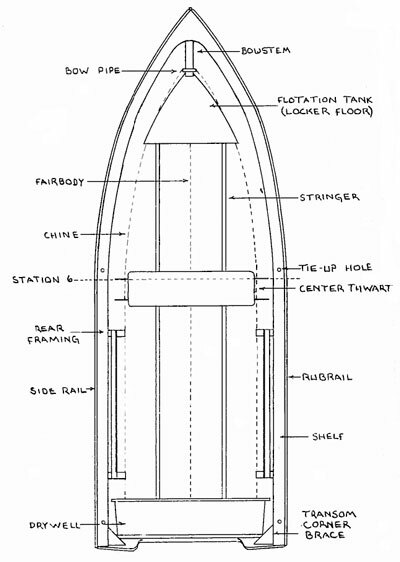 Note the chine flat—which adds beam and lift—a feature absent on the original Standard skiff, at 18′ (5.5m) and 20′. He’d brought journeyman carpentry skills to Homer, along with other attributes that ultimately characterized his life there: a passion for the outdoors (Tolman’s family, when he was young, ran a mountain resort in New Hampshire; Renn later became a pioneer ski-patrolman in Aspen, Colorado, and Jackson Hole, Wyoming); a private secondary-school teaching stint in Rhode Island (and graduate studies in history, briefly, at Harvard); assorted nomadic adventures (among them, hard-rock miner and dude-ranch tutor); and, not least, a lifelong interest in traditional Cape Breton music and in step-dancing (Tolman played flute and pennywhistle). More on the latter, later. Tolman’s lengthy, systematic search for a “proper skiff,” according to his definition of one, is what led him and partner Griswold into turning professional—and creating just such a boat themselves. Their product had to satisfy certain criteria. It must be seaworthy. It must be buildable given basic woodworking skills. It must be economical in terms of construction time and materials, and economical to operate. It must be durable. And it must be burdensome; meaning, able to accommodate gear, crew, canine(s), and provisions. (Or a commercial harvest: a 20′/6.1m Tolman skiff once delivered a documented load of 5,300 lbs/2,409 kg of salmon.) In short, Tolman sought a minimal, affordable, expedition craft, roughly equivalent to early Land Rover or Scout or Wagoneer off-road vehicles before the advent of today’s stylized sport-utility trend. A first-generation Tolman skiff was flat-bottomed, as were virtually all generic Alaskan skiffs at the time. Tolman’s design, rendered in plywood, incorporated the high bow, sweeping sheerline, and flaring topsides of a dory, coupled with a bulkhead-and-stringer construction system Griswold “borrowed” from a local builder. The build system enabled Tolman and Griswold to eliminate much structural framing so time consuming to mill out and install, and yielded an interior easier to clean and maintain. But the real breakthrough was Tolman’s wholesale adoption of epoxy resin, fiberglass cloth, and stitch-and-glue construction (a method developed many years before, in England, to produce Mirror-class sailing dinghies). Also called “composite chine construction” in The Gougeon Brothers on Boat Construction (see my article “The Fifth Edition”), stitch-and-glue made possible a structurally reliable modified V-bottom for a Tolman skiff. The V-bottom (deadrise varies with model size), in conjunction with bulkhead/stringer construction, epoxy saturation throughout, and fiberglass sheathing where necessary, give Tolman skiffs a reasonably comfortable ride in most conditions, and the desired durability for a lengthy service life, especially in challenging environments such as those that Griswold and Tolman regularly explored in their periodic long-distance outings. By the late 1980s Tolman had not only settled on a standard hullform for two sizes of skiff at 18′ and 20′, he’d also worked out all the procedures for efficient shorthanded construction in a small shop in a cold climate, and for customizing a boat with common fit-out details (cockpit sole, steering consoles, fish bins, splashwell for single or multiple motors, stowage lockers, and more), depending on the owner’s intended purpose for the skiff: e.g., cruising, recreational angling, commercial fishing, water taxi, et cetera. Tolman’s first book, on the Standard skiff only, was so successful it ran itself out of print. His second book, shown here, incorporated much of the material in the first while introducing the Widebody and Jumbo, the latter model a 22-footer (6.7m)—including drawings and guidance for suggested superstructures. Inset photo on the cover: Tolman and then-partner Mary Griswold stitch the forefoot of a skiff prior to applying glass and epoxy to the joint. Had Tolman remained merely a local builder, his legacy would have been secure—but only in the area around Homer. As a former teacher, he couldn’t resist writing a how-to book about his boat. Published by International Marine in 1992 (and dedicated to Griswold, whom Tolman thanked for her editorial assistance), it was titled A Skiff for All Seasons: How to Build an Alaskan Skiff. That book—articulate, comprehensive, generously illustrated, and thoroughly researched—put Renn Tolman and his proper skiff on the national, even international, map. Sales response to All Seasons was gratifying, but during the ensuing decade Tolman’s skiff design was evolving rather quickly due to a host of factors he hadn’t anticipated in ’92. His customers and readers seemed to want bigger boats, preferably with pilothouses. They also wanted bigger engines than Tolman specified—a situation complicated by the marine industry’s rapid conversion to four-strokes, heavier at every horsepower than the two-stroke counterparts. That extra weight often exceeded Tolman’s posted limits at the transom. All Seasons, meanwhile, went out of print. So Tolman wrote a second volume, issued in 2003 by Kamishak Publishing, an imprint he established to better determine the destiny of book sales, including book one, which Kamishak Publishing reissued in limited quantity. 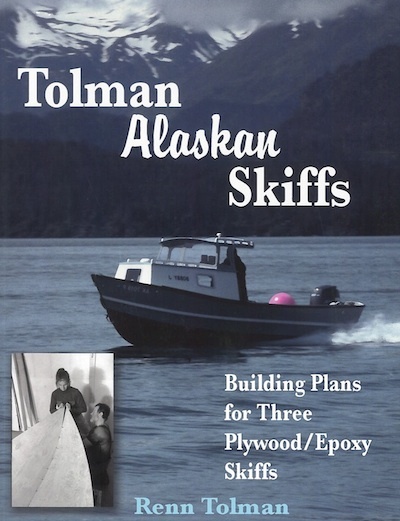 Titled Tolman Alaskan Skiffs—note that Tolman now appended his name to an Alaskan skiff—his second volume carries the cover line: “Building Plans for Three Plywood/Epoxy Skiffs.” Page count is higher, and the format larger—as are the skiffs. Tolman’s original “Standard” skiff is still present, but he introduced two new models: the “Widebody,” a 20-footer with greater beam, thanks to the addition of a chine flat; and the “Jumbo,” a 22-footer (6.7m) with deeper deadrise. The two new models were meant to carry the extra weight of superstructure if desired, and a four-stroke main plus smaller auxiliary outboard. His second book, highly recommended, includes most of the technical and visual information in the first, minus some of the storytelling. It can be ordered from The WoodenBoat Store. Professional BoatBuilder learned of Tolman’s death from Street, who sent us links to stories about him, and obituaries, that ran in Homer newspapers. Those pieces say less about Tolman’s skiffs than they do about his music and community spirit: Tolman turned his boatshop into a dance hall on an annual basis for a gala New Year’s Eve party, heavily attended by friends and townspeople. Like the skiffs, Tolman’s flute and pennywhistle are seemingly simple instruments that, in practiced hands, can do amazing things. Step-dancing added yet another dimension. Besides the e-mail from Betsy Street, I also got a phone call one night in July from Tom Beaudoin, a pal of mine who had relocated to coastal Alaska in the late 1970s and, like Tolman, arrived there with strong carpentry skills and a powerful urge to fish and hunt in a wilderness Beaudoin’s native Maine no longer offered. Your boat endures, Renn. As intended.